Cocoa solids are also what gives a chocolate bar most of its flavour and colour, and because it does not go rancid, and keeps so well, cocoa is an invaluable friend in the kitchen pantry (but not in the refrigerator, because it also absorbs moisture and odours). The reason it is such a good friend is because you can’t eat cocoa straight out of the tin. Believe me, I’ve tried and it is not a pretty sight, although it does make an effective stage moustache. You actually have to go to the effort of making something with cocoa, and this sort of helps to slow down those impulse cupboard raids. 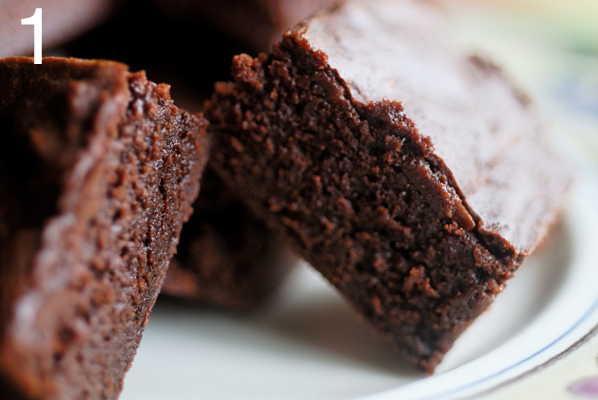 You know when you’ve filled the kitchen with the wonderful smell of baking brownies, by the time you pull them from the oven, you’ve earned your chocolate. And the differences and complexities in tastes from one type of cocoa powder to the other, turns working with cocoa into alchemy. In 1828 Casparus van Houten Sr. patented an inexpensive method for pressing the fat from roasted cocoa beans. The center of the bean, known as the “nib,” contains an average of 54 percent cocoa butter, which is a natural fat. Van Houten’s machine–a hydraulic press–reduced the cocoa butter content by nearly half. 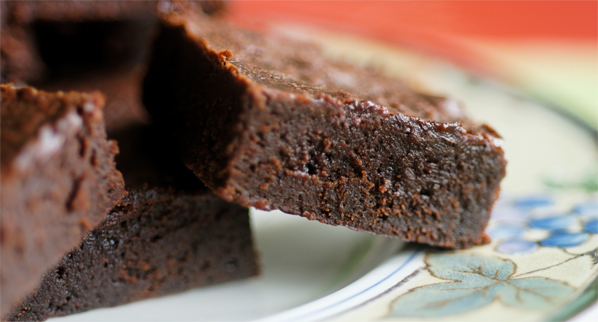 This created a “cake” that could be pulverized into cocoa powder, which was to become the basis of all chocolate products. Coenraad Van Houten (Casparus’ son) introduced a further improvement by treating the powder with alkaline salts (potassium or sodium carbonates) so that the powder would mix more easily with water. Today, this process is known as “Dutching”. 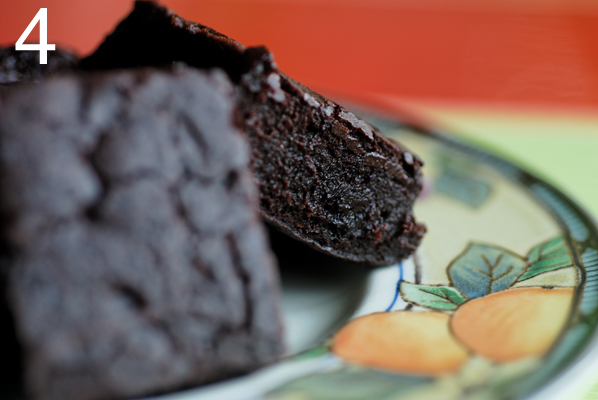 The final product, Dutch chocolate, has a dark color and a mild taste. The Broma process is a method used to remove cocoa butter from cocoa mass, leaving cocoa solids (cocoa powder). In about 1865 someone at the Domingo Ghirardelli factory discovered that by hanging a bag of cocoa mass (ground cacao beans) in a warm room, the cocoa butter would drip off, leaving behind a residue that can then be processed into cocoa powder. 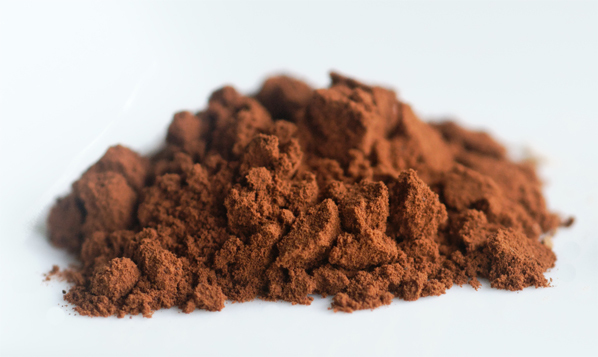 More cocoa butter (fat) is extracted by using the Broma process than using a hydraulic press, and less fat remaining in the cocoa (powder) makes it easier to dissolve the cocoa into liquids. 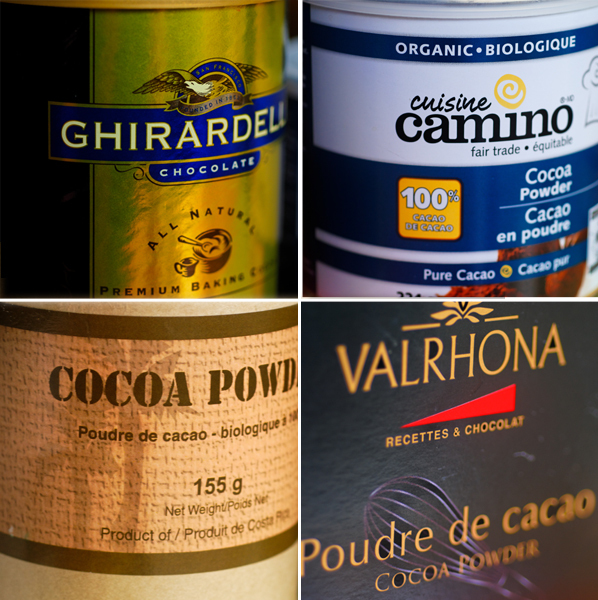 Broma process cocoa also has a more intense flavor than Dutch process cocoa, as no alkalis are added to the cocoa. 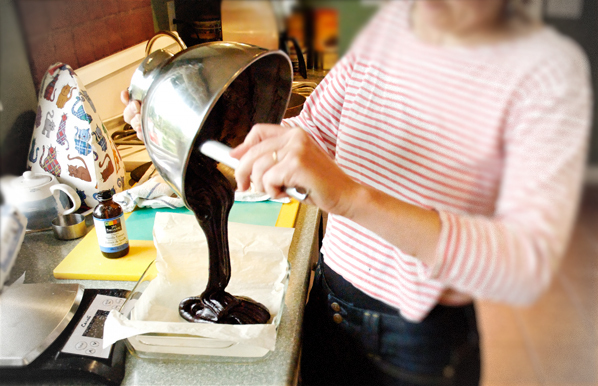 In an effort to discover the alchemy of these different kinds of cocoa, I am preparing four pans of brownies, as they are a relatively quick and straightforward concoction. 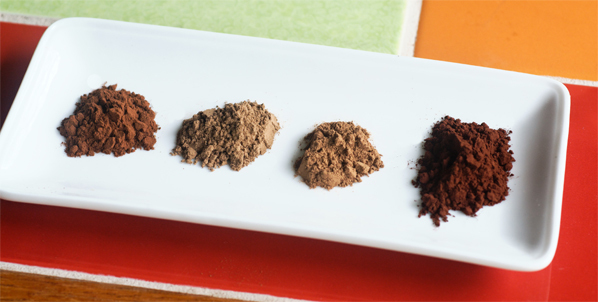 Using the same recipe, exactly the same ingredients, method and utensils, the same level of humidity and temperature in the kitchen, all four batches have only one variable – the cocoa. 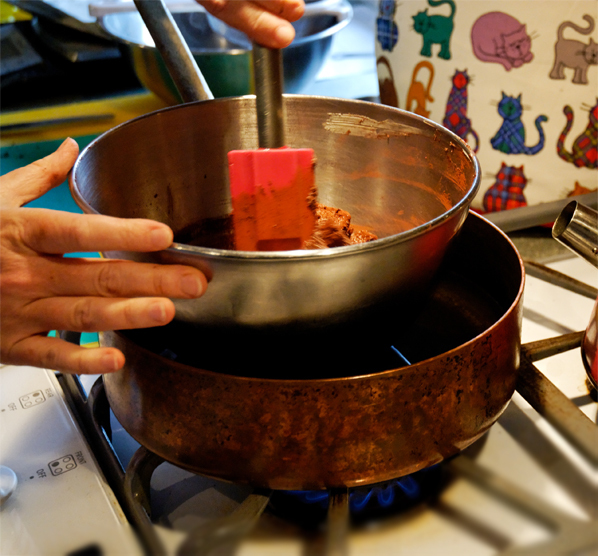 I use a recipe with an interesting method of preparation, which includes stirring the ingredients over a bain marie. Here it is, taken from Alice Medrich’s Bittersweet. As I have been setting up the kitchen as a lab, barking at anyone who tampers with my utensils or ingredients, explaining patiently that this is in fact, an experiment I am conducting, my sons have patiently pointed out that I need to state my hypothesis for this lab. They are quite correct. 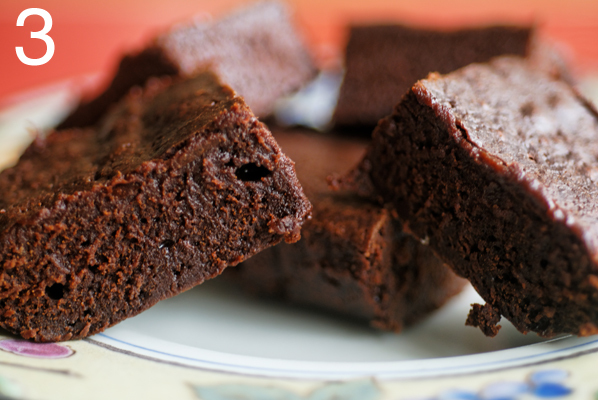 Therefore, based upon scrutiny of this recipe, I hypothesize that, while the author states that any cocoa may be used in its preparation, there will be significant taste, texture and differences of appearance to the final product, because chemically, the brownies made with natural cocoa (versus Dutch processed), will be more acidic (which is not necessarily a bad thing), as there is no baking soda (which is alkali) in the recipe to temper the acidity. The Costa Rica is a cocoa I picked up at a local gourmet food supply store, and I know nothing about it, so am intrigued to find out its unique properties, if any. The Cuisine Camino is an old friend of my pantry, and the Ghirardelli and Valrhona, acquaintances I am eager to know better, as I have long been fond of their bar chocolate relatives. I have a convection conversion oven, but decide to bake these batches on the regular cycle, in order to follow the recipe as closely as possible. It’s an investment of an evening, and I do find it very contemplative to stand over the bain marie, stirring together the butter, sugar and cocoa. I highly recommend it as a method for slowing and composing one’s thoughts. As each batch comes out of the oven, I line them up to cool completely, banishing any family members from making even the smallest “test” cut. I want everything to be precise. Finally, the moment of truth. We all sit down with sample plates and glasses of cold milk. 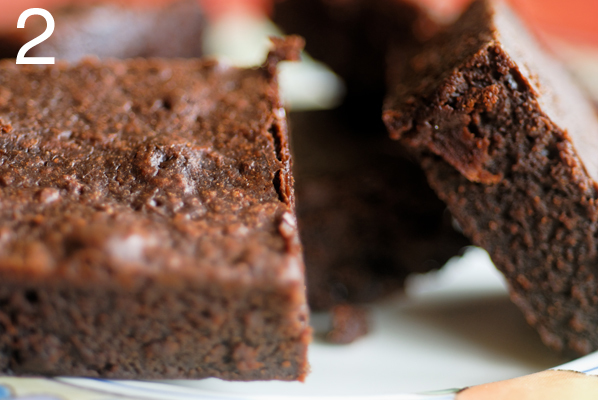 We should probably have used water, but I just couldn’t sample that many brownies without the moo-juice! At the same time, I have taken samples to another family of four, with two teenage boys (exactly the same criteria as our house!). Our friends have graciously agreed to sample and compare the brownies. This truly is a blind taste test for me, as I have forgotten the order of the cocoas I used, although the plates are safely numbered and cross referenced with a pencilled number on the parchment lining each batch. Costa Rica – different, interesting, earthy, muddy, tangy – is there something other than cocoa in this one? Valrhona – Black colour, bland, fruity, no aroma, is it cocoa or fruit? And I love their note at the bottom: “Okay, so we’re better at eating than analyzing…”! 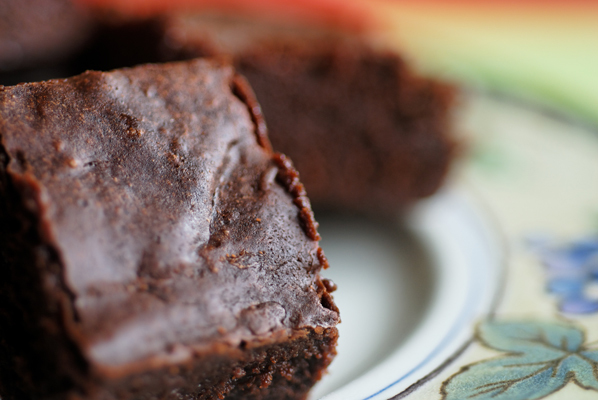 Overall, with this particular recipe, both families much preferred the batches of brownies made with the Ghirardelli natural cocoa, and the Cuisine Camino Dutch Processed Organic cocoa batch. 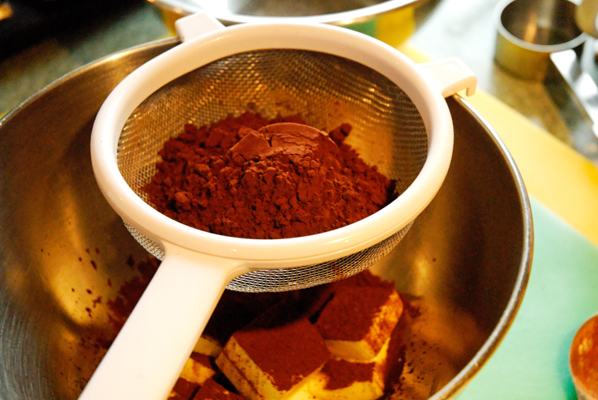 Two very different cocoas, but they both work very well for this particular recipe. I would say that I would NOT go out of my way to buy the Costa Rica cocoa again, as it definitely has an odd “something that tastes other than chocolate” about it, which I would not trust to impart a clean taste. On the other hand, although I personally did not care for the way the Valrhona cocoa brownies turned out, I love the way it looks and sifts, and I think it will be lovely to dust a batch of dark chocolate ganache truffles I have needed a good excuse to make. And with the turn in the weather (yes, it really does feel like Autumn) these wonderful cocoas will be hard at work in my house, becoming dark, complex and oh so comforting hot chocolate.